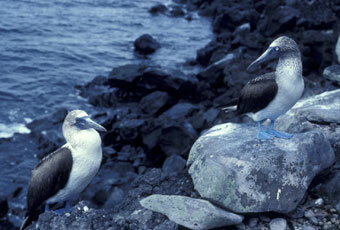 Marine fish and birds (seabirds) may leave Galapagos, neglect to breed, or die during a severe El Niño. 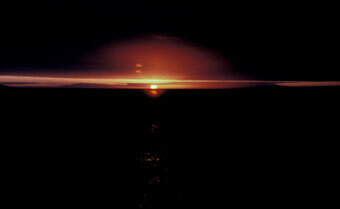 Galapagos is often known for its abundant fish, sharks, and whales because it is in such a productive area of upwelling. The upwelling provides abundant nutrients for the phytoplankton, the phytoplankton blooms provide abundant food for the zooplankton, the zooplankton is eaten by an abundance of small fish and larger fish eat these small fish. The food chain is usually very complicated with many species. However, during extreme El Niños (like '82/'83) the lack of nutrients (and the warm water) create an adverse environment for the phytoplankton and thus there are few zooplankters, few small fish and the food chain collapses. 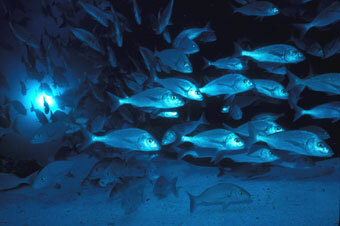 The larger fish, sharks and whales usually leave areas that have little to eat. This was the case in '82/'83. The fish that were left were few and far between. 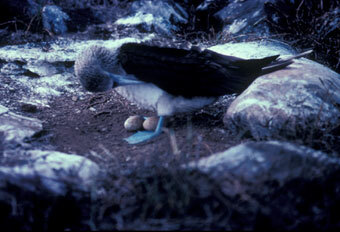 Fish eating birds, like the Blue-Footed Booby (Sula nebouxii), are hit hard by severe El Niños. 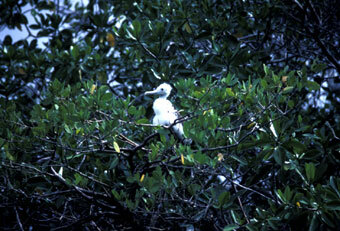 These birds feed on fish within a mile or two of the shoreline. 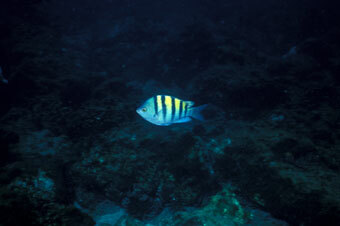 Generally there are plenty of fish for them in the productive coastal waters of Galapagos. 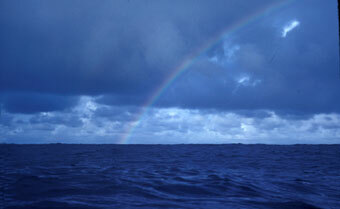 During severe El Niños they spend a lot of energy flying around and looking for the elusive few fish that may be left. 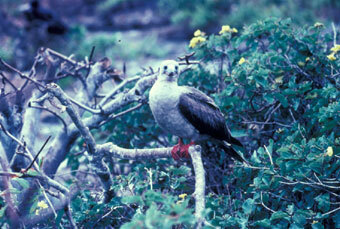 During '82/'83 these birds were present in Galapagos but they did not reproduce at all. 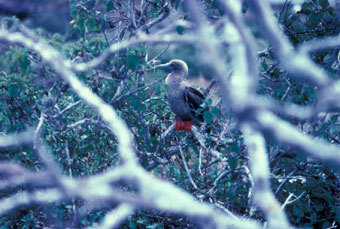 Red-Footed Boobies (Sula sula) have an even harder time in a severe El Niño. This species does not feed by the coast; instead it flies several miles from the coast and catches fish there. 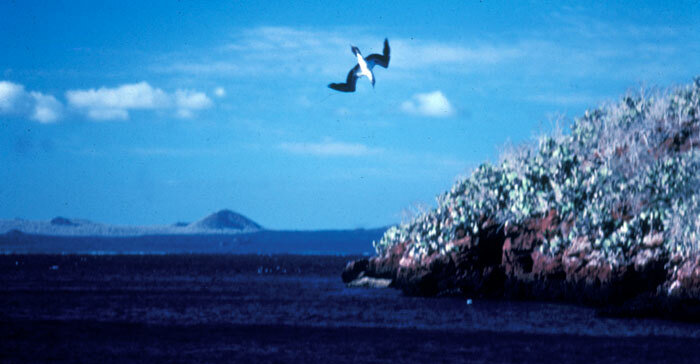 This increase in the amount of energy needed to look for their food caused most of the red footed boobies to leave Galapagos during the '82/'83 severe El Niño. 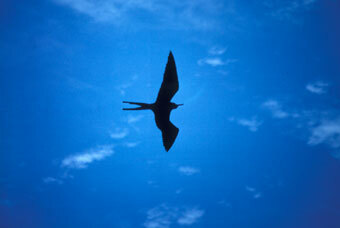 It is not known if these birds died or if they just flew to a more productive area. Frigates put even more pressure on the boobies that were left in Galapagos during '82/'83. 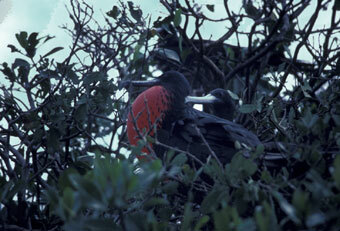 Frigate birds (Fregata minor) are pirates and harass other fish-eating birds to drop their catch. 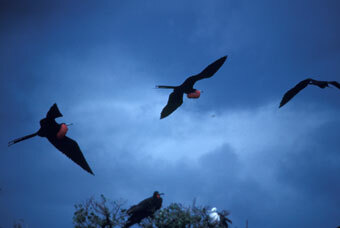 The frigates are larger birds and are usually successful in their attempts to steal the fish from a booby. 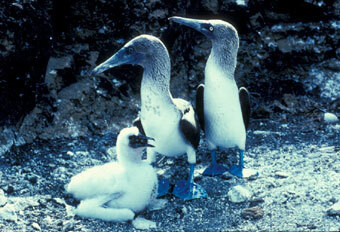 Any poor blue footed booby that did catch a fish during '82/'83 was likely to loose it to a frigate. The frigate colonies appeared normal during the severe El Niños of '82/'83 although if the El Niño lasted much longer they too would have felt the effects. They were one of the only seabirds that had successful reproduction in their colonies during '82/'83. 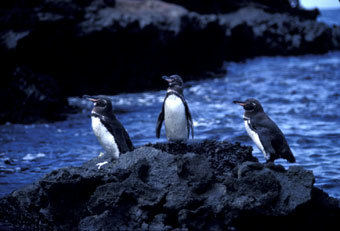 An endemic species of penguin is found in Galapagos. 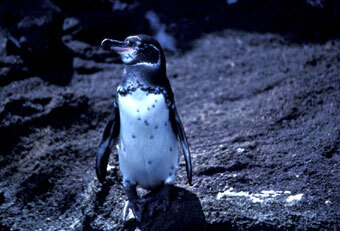 The Galapagos Penguin (Spheniscus mendiculus) is the northernmost species of penguin found in nature. In fact, a few penguins are just north of the equator on the northern ends of the islands of Fernandina and Isabella in Galapagos. These fish-eating birds were left without food during the '82/'83 El Niño. Without the ability to fly, the penguin was left to suffer through bad times. During severe El Niños there is little reproduction and these birds hang around the shoreline looking very sad. 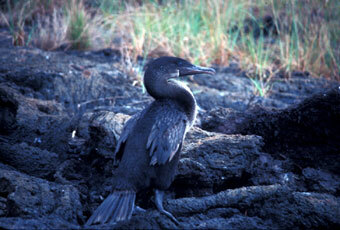 Another endemic fish eater is the Galapagos flightless cormorant (Nannopterum harrisi). 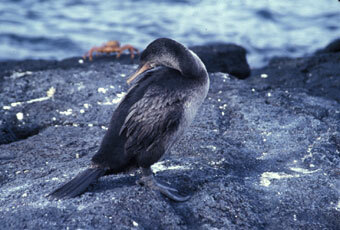 This seabird is unique in the cormorant group because it has lost the ability to fly. The ancestors of the native species in Galapagos originated from the chance arrival of species across the ocean by flying, floating or swimming. The islands were never connected to a populated landmass and originated as volcanic islands devoid of life. There were no large predators (and no native peoples) that arrived as the flora and fauna of these islands began to take shape. Being isolated for so long, the species of animals that did establish themselves were without fear of large predators and humans for many years. This is one of the most wonderful things about the Galapagos - the fearless nature of the animals that live there. You can get right up close to almost all of the birds and reptiles without their running away. The flightless cormorant has reduced wings that are thought to have evolved from the lack of the need to fly away from large predators. 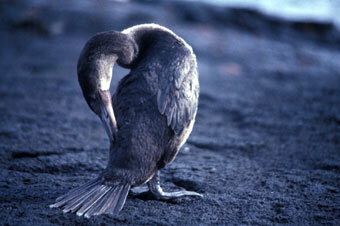 Like the Galapagos penguin, the Galapagos flightless cormorant suffered through the severe '82/'83 El Niño. 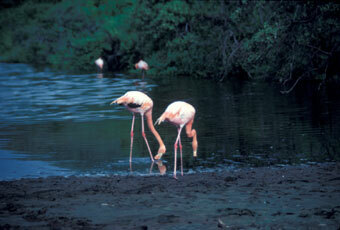 Even endemic flamingos are found in Galapagos. These birds (Phoenicopterus ruber) usually inhabit lagoons where small crustaceans flourish in the waters. They filter out the small crustaceans with their head turned upside down. It is a pigment in their crustacean food that is responsible for the pink color. 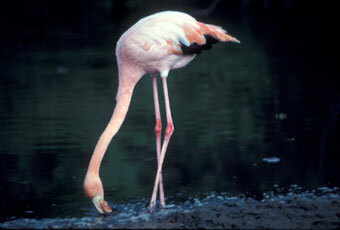 Without crustacean food, the flamingoes become pale and almost white. The Galapagos flamingo was considered to be in danger of extinction (in the 1960s and 70s) as there are only a few individuals remaining in the few shallow-water lagoons where they feed and nest. 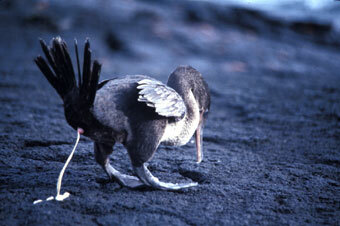 El Niño has both positive and negative effects on the wildlife of Galapagos. The terrestrial plants and terrestrial herbivores are positively effected and the marine plants and animals in, or dependent upon, the upper waters are negatively effected. 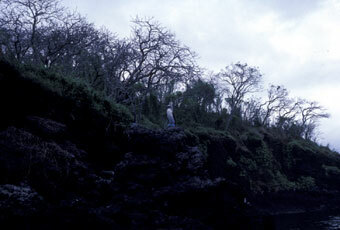 El Niños come and go every 3-10 years in Galapagos as it has been for millions of years and will continue to be. The life forms there are used to this and it is only in extreme El Niños that the effects are so pronounced (either positively or negatively). After an El Niño, life returns to 'normal' and population numbers generally go back to a more stable state (although some permanent alterations may occur).